Robert Burns Mausoleum stands at the eastern end of the churchyard of St Michael's Church, whose red spire dominates the south east side of Dumfries and makes finding the mausoleum relatively easy if you know what to look out for. Having found the churchyard you pass by the south side of the church and soon come into sight of the mausoleum. There is no mistaking it: in a churchyard populated almost entirely with large monuments made of red stone, its white structure and dome stands out strikingly. Robert Burns lived from 25 January 1759 to 21 July 1796. He is regarded as Scotland's national poet: an icon who has loomed large in Scottish culture and consciousness ever since his death at the early age of 37. In 1789 Burns moved to Dumfries to take up a post as an Excise Officer. He died of rheumatic fever seven years later, at the same time as his wife Jean Armour was giving birth to their ninth child. Robert Burns was initially buried in the north east corner of St Michael's Churchyard, but before long his growing army of devoted fans began to feel that his existing grave was insufficient recognition for his genius. A circular was published on 29 November 1813 calling for the public to subscribe to the cost of a mausoleum. 18 local worthies attended a meeting in the George Inn in Dumfries held on 16 December 1813, and the project was launched. Amongst those who took a leading part in the fund raising campaign was Sir Walter Scott. Money flowed in from all over Great Britain and from as far afield as India and America. By spring 1815 enough funding was in place for the work, based on a design by Thomas Hunt of London, to be put out to tender. The contract was won by a local stonemason, John Milligan, with a tender of £331.8s.6d. The first stone was laid on 5 June 1815, in a less crowded part of the churchyard than where Burns had initially been buried. 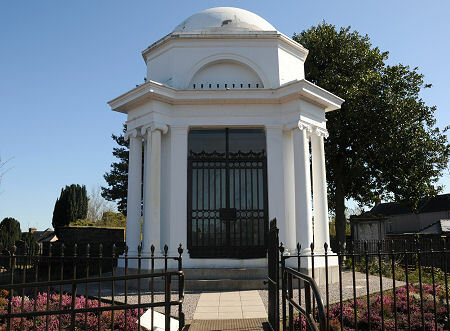 The construction of the mausoleum ran into a number of problems caused by Milligan's failure to comply with the specifications or take directions from the committee supervising the work. It was only in September 1817 that the mausoleum was complete and the monument installed within it. 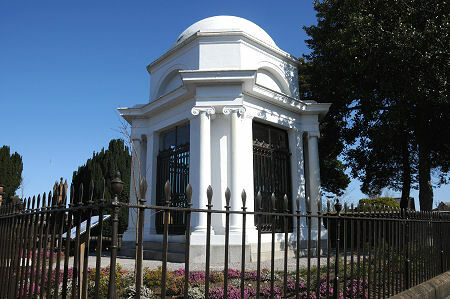 The actually monument within the mausoleum was the work of Peter Turnerelli, an Irish-Italian sculptor working in London. The statue on the wall shows the Muse Coila hovering above the figure of Robert Burns who is standing by his plough. A midnight on 19 September 1817, Burns' remains were disinterred from his original burial place, along with those of two of his sons, who had died at the ages of 9 and 2. While the children's coffins were intact, Burns' coffin was in a poor state, revealing the remains of the body within it, which then itself disintegrated when moved. The remains of Robert Burns and his two sons were then reinterred under the floor of the new mausoleum. His wife Jean Armour was buried in the mausoleum on her death in 26 March 1834, as was his son Robert, who died on 14 May 1857. In 1946, the 150th anniversary of Burns' death was marked by the recarving of the grave slab within the mausoleum, and by the insertion of memorials to other members of the family buried here. When it was originally completed, the mausoleum was externally unadorned, with its finish coming from the red sandstone it, like everything else hereabouts, is made from: and it probably looked better for it. It was painted blue and white in the 1880s, apparently in an attempt to protect it from atmospheric pollution, and has since been painted plain white. The statues were extensively restored in the 1930s.